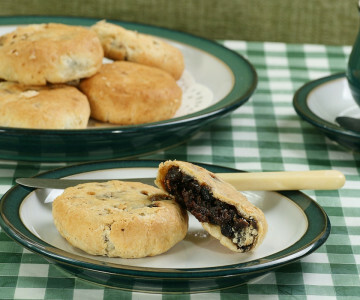 A favourite northern recipe, these Eccles Cakes are simple to make and are busting with dried fruit. Despite being called cakes; they are actually made out of buttery pastry and make a tasty treat alongside your cup of tea. You will need two baking trays covered with non-stick silicone coated baking paper and an 11cm round cutter. 1)The night before you want to make the cakes, place the fruit, nutmeg, lemon zest and brandy in a bowl. Stir well, cover and leave overnight. 2) Preheat the oven to 200°C fan/220°C/390°F/gas 7. 3) Add the sugar to the fruit mixture and stir well. Melt the butter in a small saucepan and stir into the fruit mixture. 4) Cut the pastry in half. On a floured surface, roll out one half to about 3mm thick and cut out five 11cm rounds. Place a tablespoon of the fruit mixture in the centre of each round, brush the edges with water and then gather the pastry around the filling and squeeze it firmly to seal. Turn the cakes over, dust your hands with a little flour and flatten each cake slightly. 5) Place all five cakes on a baking sheet, evenly spaced apart, and brush with the beaten egg white. Sprinkle with a little demerara sugar and cut three 1cm/½ inch slits in the top of each cake. 6) Bake for 15–20 minutes until golden. Place on a wire rack to cool. 7) Make the second batch while the first batch is baking.